← Oil Creek 100 Update! – to Make a Difference!- Running for a cure! 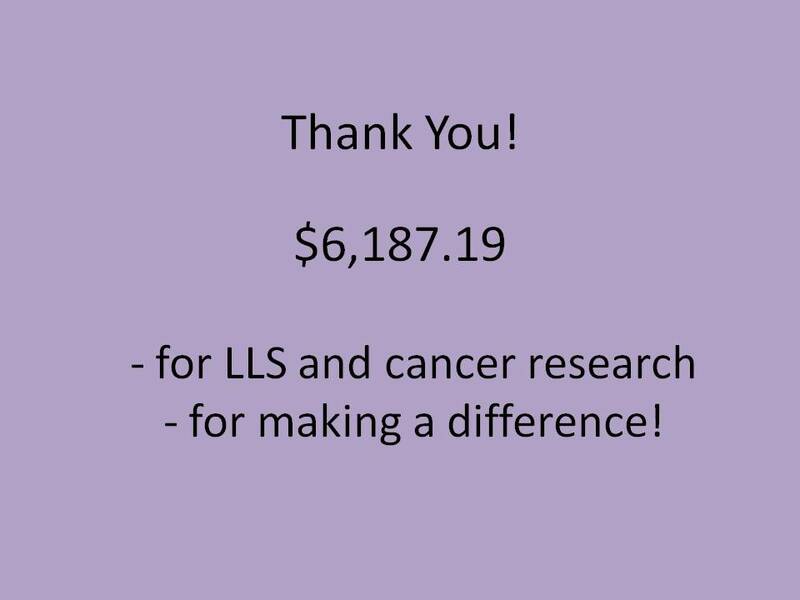 Final Update…wrapping up fundraising for this year for LLS and cancer research! Fundraising Total: $6,187.19 which is $1.19 more than any previous year in 8 years of fundraising. Woohoo! Thanks so much for all your help…the donations and the support…from me and all of our Honorees! Our recent donors included: Becky Ohm and the staff and customers at The Flying Joe, Roger and Kristin Davenport and the employees of K & R Auto Repair, Sheryl and Terry Losey and the customers at Outstanding Nutrition, Scott Lewis, Kevin and Monica Drouillard, Frank Cody for a second donation towards the Buck a Mile for the Oil Creek 100, Jenn Starr and Peggy Masters and the staff and customers of Maumee Quick Print, John Frank and the staff and customers at the Heatherdowns Branch of Key Bank, and a final thank you to Bill McConnel owner of Dunright Building Services for his pledge of the last $250 “to get us over the top and give us something to shoot for next year!” Thank you Bill!! Thanks again to all of our previous donors: Dave Large and his fellow employees at Bolt Express, Dave Schlaudecker for a second donation, Martha Lewis for a second donation, and a huge donation from Steve Grindle and the staff and members of Champion Credit Union, Stacy Warren, Bob Bethel, Ruthellen Ondrus, Bonnie Kimpling-Kelly, Frank Cody, Judy Kehrle, George Brymer, Dana Zanville, and Doug Hartman, Joe Erard, Jennifer Smirnoff-Poling, Scott and Betsy Saneholtz, Jim Veller, Sean Thomas and the Employees at Axis Engineering, Dan Robertson, Jennifer Starr, Joel Salazar, Gary Ehrmin, Darlene Lorenzen, Frank Cody, and Deb Chany and Dr’s Jeff and Rachel Elmore, Matt Folk, John Frank, Debby Peters, Honoree George Evanoff, Kathy Pigott, Brendon Matthews, Honoree Karen Landis, James Hunt, Martha Lewis, and Mike and Shannon Irmen, Honoree Carol Haddix, Pam Weirauch, Michelle Marentette-Hermanutz, Shelley Foos, Michelle Ansara, Tom Spy, Violet Stoycheva, Kevin Simpson, Honoree Rodney Cundiff, Jenn Wenzke, Honoree Andrea Loch, and Deb Yeagle. I think that is everyone. If I missed anyone, I sincerely apologize. Thank you All! A Big Woohoo! to each of you! Friend and Honoree George Evanoff is recovering from his surgery last week. He is doing well. My sister Elizabeth is past her last chemo treatment and going strong. Both of them are tough and relentless…my inspiration. Please keep all of our Honorees in your thoughts and prayers. Thanks so much! Finally, thank you from the bottom of my heart for another successful year of fundraising. Thank you for helping fight the good fight. I appreciate each and every one of you and all of your kind words and support throughout the year. I couldn’t have done it without you! It’s been another incredible year…3 events, our Honorees having their ups and downs and adding so many new ones, and it was inspiring with so many donors stepping up…I can’t say it enough…thank you all so much!